It’s time to get snap–happy as we enter our third photography competition. Each month we will be running a themed photography competition through our Twitter, Facebook and Instagram page. The monthly competition was launched in May and we received lots of beautiful entries. Following the success of last month, June’s theme was butterflies to celebrate our newly opened Butterfly House, a haven for some of the world’s most beautiful winged creatures. We received a lot of colourful photographs, however there could only be one winner. 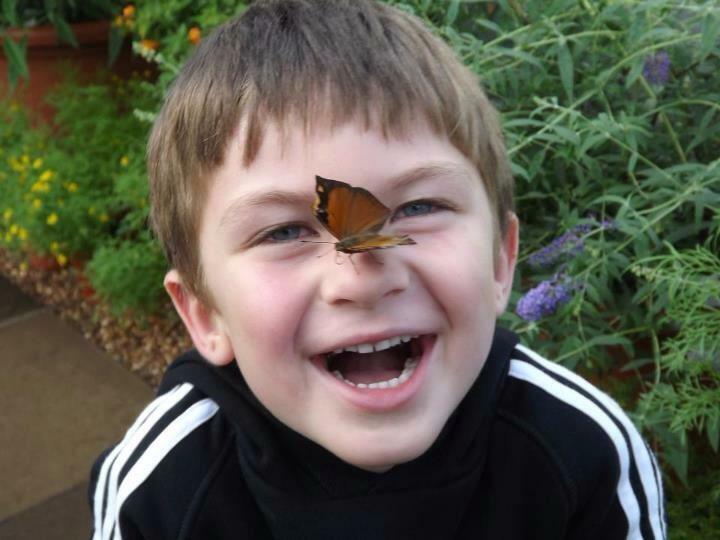 Free entry for two to our gardens and a special talk about our resident butterflies went to Jemma Sagar for her brilliant Facebook entry of her son, William with a butterfly elegantly perched on his nose. This month’s theme is favourite children’s books, with the prize being a family ticket to one of two fabulous shows during the summer theatre season at Birmingham Botanical Gardens. Be as creative as you like with your entries, perhaps a photograph of the whole family gathered together in our gardens reading your favourite children’s book or iconic characters created out of flowers – it’s completely up to you! To enter July’s photography competition to win family tickets to either Chapterhouse Theatre’s Jungle Book or Rain or Shine Theatre’s Treasure Island, proudly post your snaps to Twitter, Facebook or Instagram with the hashtag #BBGPhotoComp. The contest will be running until Thursday 31st July and the winner will be announced on 1st August, along with a new photography theme to get involved with. So, what are you waiting for? Get those cameras out! Make sure you check out May’s and June’s entries on our Storify and Flickr pages for a little photographic inspiration.